Treat Yo’ Self to an experience of pure decadence. 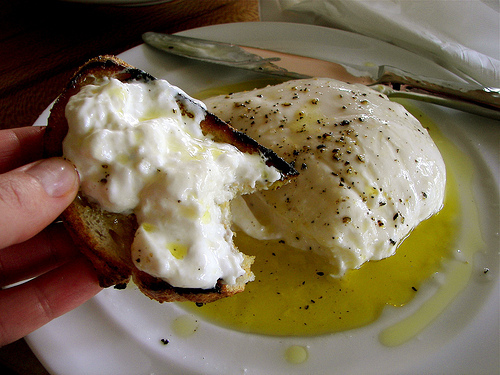 Burrata is an Italian cheese made of fresh buffalo or cow’s milk from Puglia, in Southern Italy. It has the soft exterior of Buffalo Mozzarella, but inside is a center of cream. For an impressive presentation, serve at room temperature. Slice into the lusciously rich mound of fresh cheese and watch the liquid interior ooze from it’s core. Drizzle with fruity olive oil and a few cracks of pepper to complete the dish. Serve with fresh bread alongside proscuitto. do you have a recipe to make these cheese? Just curious how different it is from making regular Motz? I adore burrata! Especially with good quality olive oil, some salt and pepper and crusty bread. Some good tomatoes don’t hurt either.